Heart Medicine by E. Bast is a powerful memoir that explores love, addiction, and healing. 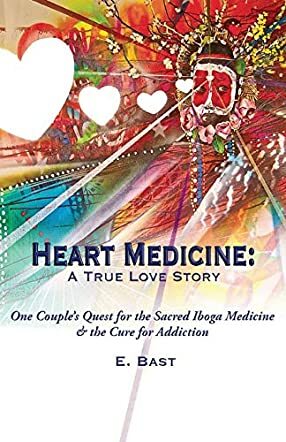 The heart of the message of this book is captured in the sub-title: A True Love Story - One Couple's Quest for the Sacred Iboga Medicine & the Cure for Addiction. Getting clean from an addiction is one of the huge challenges that millions of people are facing across the world. The greatest fear of a “user” is to relapse. This has been the worst nightmare of Chor Boogie, a man who has been clean for over a decade before meeting his wife. This lyrical, brutally honest, and raw narrative takes readers on an odyssey of healing from addiction, a journey to the miracle of the iboga plant. Can one get completely clean from addiction? Yes. Chor Boogie and E. Bast find the answer in the African indigenous plant called the iboga. E. Bast’s story is a powerful message of hope for everyone who feels trapped in their addictions, suffering from one relapse to another, a book that documents the perils of drug addiction and the secrets to lasting healing. Heart Medicine is well-written; the prose is crisp and polished, and it rings through with vivid imagery and lyricism. Apart from being an inspiring story, it has great potential to entertain readers. The naturally woven dialogues make the story come alive and allow the reader to understand the depth of the psychological conflict and the challenges the characters face. Readers will find the ultimate cure for addiction in this book, but they will also discover the mysterious power of love. I enjoyed every bit of this story — the beautiful prose, the sheer honesty of the narrator, the logical sequence of events, and the transformation that comes along as a result of love. This book is the best I have ever read about love and addictions. It’s magical.